While there are a few nice enhancements in Autodesk’s AutoCAD Civil 3D for 2013, unfortunately there seems to be something missing. 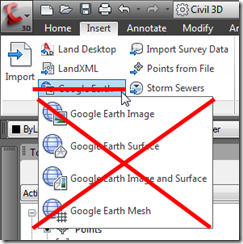 Civil 3D 2013 will not have Google Earth extensions. This may seem inconsequential to many, however it is an absolute life saver in so many workflows. This will unfortunately set the industry back a step by removing a process that gave engineers and planners access to geo-referenced images and terrain models instantly in Civil 3D, a process that we’ve enjoyed since 2008. I infer from reading posts and comments that there are some legal ramifications associated with the extensions, and until these are resolved, there will be no Google Earth goodness. Unfortunately I cannot report beyond the limits of any non-disclosure agreements. 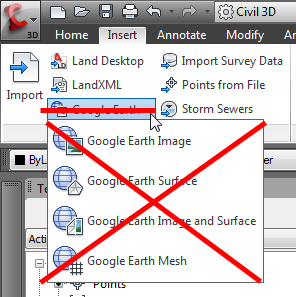 Due to limitations on the use of the Google Earth API, AutoCAD® Civil 3D® 2013 does not include API access to allow customers to import Google Earth imagery and/or surfaces directly into Civil 3D. We are aware of the importance of including preliminary surface and aerial imagery in your design workflows and are actively looking for an alternative. However, we cannot share any specific information about potential future product enhancements. When appropriate, we will communicate technology plans via various channels including Autodesk Labs, Facebook, Blogs and the Civil 3D Discussion Group. People are welcome to contact be directly via EMAIL to discuss.